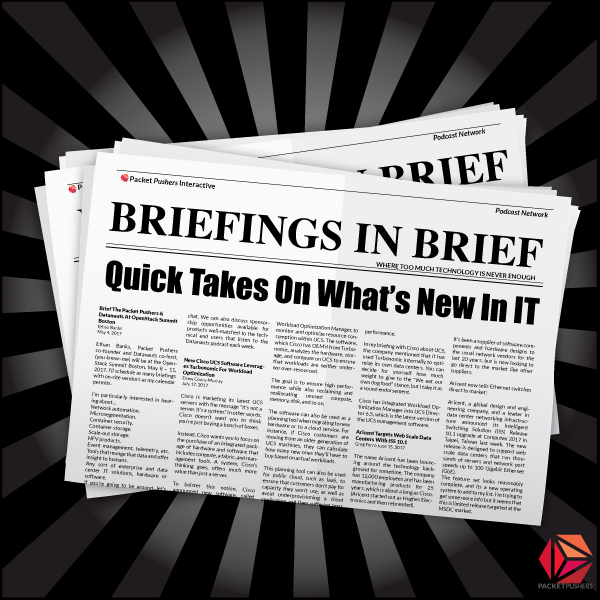 Briefings In Brief - Vendor News In 5 Minutes. Technology vendors update the Packet Pushers constantly with big announcements and blue sky visions. Subscribe to Briefings In Brief for our summaries of the press releases & conversations we find interesting. We filter the bloviation and bombast down to the best bits. Ethan Banks had a briefing with ReSTNSX, and they demoed their VMware NSX-enhancing platform to him. Have a listen for Ethan’s impressions of the demo. Virtual Instruments has visibility and testing tools for FibreChannel networks. Are there signs of change in the storage marketplace ? Yes, I think so. Netscout talked to Ethan Banks about how they are unifying visibility fabrics inside of an IT team with features like security tool chains. Ethan Banks does a quick walk through of VMware’s official release notes for NSX 6.4. Mellanox, Ixia, and Cumulus Networks shared the presentation stage at Networking Field Day 17 to talk EVPN VXLAN, whitebox switching, open source, and data center design and performance validation. Cisco Systems presented at Networking Field Day 17. Three broad themes emerged from the presentations: intent, automation, and telemetry. VMware presented at Network Field Day 17. The company covered several topics, including an update on VeloCloud, NSX-T features, and a dive into the latest version of vSphere. Juniper Networks presented for a second day at Network Field Day 17, this time focusing on Appformix for analytics & automation; and PeerBot, a BGP configuration application. Extreme Networks demonstrates network automation via Workflow Composer and StackStorm at Network Field Day 17. ThousandEyes presented at Network Field Day 17 on Internet visibility, monitoring customer experience, and improving mean time to innocence for the network. Juniper brings OpenContrail into the Linux Foundation & expands the commercial Contrail for security and multi-cloud. Recorded live at Network Field Day 17. NetYCE gives Ethan Banks an overview of their platform and shares some of the latest capabilities they’ve baked in. CloudPassage talked with the Packet Pushers about Container Secure, a product announcement they made at AWS re:Invent earlier this year. Ethan Banks shares his impressions. LightStep cofounder Ben Sigelman briefed Ethan Banks on their SaaS performance monitoring product with microsecond resolution for cloud native apps. Holy cow. Broadcom Tomahawk 3 is a 32 x 400G ASIC at lower power, latency and reduced cost/100G speed. Built for the cloud it signals the next generation of 200G/400G Ethernet is on its way. Juniper Networks has announced a trio of bots that aim to accelerate the adoption of automation in enterprise networks. Barefoot Networks is big in the programmable networking space, known for their Tofino chip as well as the P4 programming language. In this briefing, Barefoot announced Barefoot Deep Insight, a network monitoring system they claim goes deep on every packet in the network. Ethan Banks reports. Cisco Tetration came out of the gate as a deep analytics and insights platform and is rapidly iterating on a variety of use cases. In this briefing, Cisco discussed how Tetration can be used for network security. Ethan Banks discusses. Kemp 360 Vision is a SaaS product helping enterprises understand their application delivery fabric and stay ahead of problems using proactive monitoring. Ethan Banks summarizes a briefing he received at NFD16, where Gigamon describes sending rich metadata feeds as IPFIX records from GigaSECURE to Splunk. Ethan Banks highlights interesting points from a presentation on 400G by Arista Founder, Chief Development Officer, and Chairman Andy Bechtolsheim.